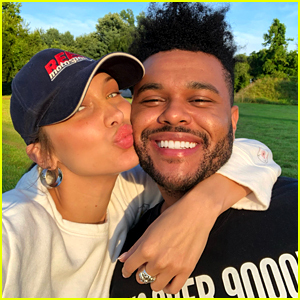 Bella Hadid & The Weeknd Link Arms After Birthday Brunch | Bella Hadid, The Weeknd | Just Jared Jr.
Bella Hadid walks arm in arm with boyfriend The Weeknd while leaving Sadelle’s on Tuesday (October 9) in New York City. The couple both wore black jeans, jackets, and boots as they stopped in for a bite to eat on the model’s 22nd birthday. Earlier in the day, Bella and The Weeknd were seen holding hands as they left her apartment building. In case you missed it, The Weeknd wished his girlfriend “Happy Birthday” with a short and sweet message on Instagram with photos and video of the couple. FYI: Bella is wearing an Unravel top and Gigi Hadid for Vogue Eyewear sunglasses. The Weeknd is wearing Gigi Hadid for Vogue Eyewear sunglasses.